Users may contribute to the text. If you see anything that needs correcting or expanding, please click on the edit link and make the corrections. A copy of the next edition of the book will be given to the user who makes the most edits. User contributions are reviewed by Mary Ashley. In this table, religion achieves the largest share of donations in terms of total monetary value (14%). If the process of secularisation in the UK continues at its current rate, the case for tax relief for religious charities may come under scrutiny (though conversely, the sums given for religious charities would decline). 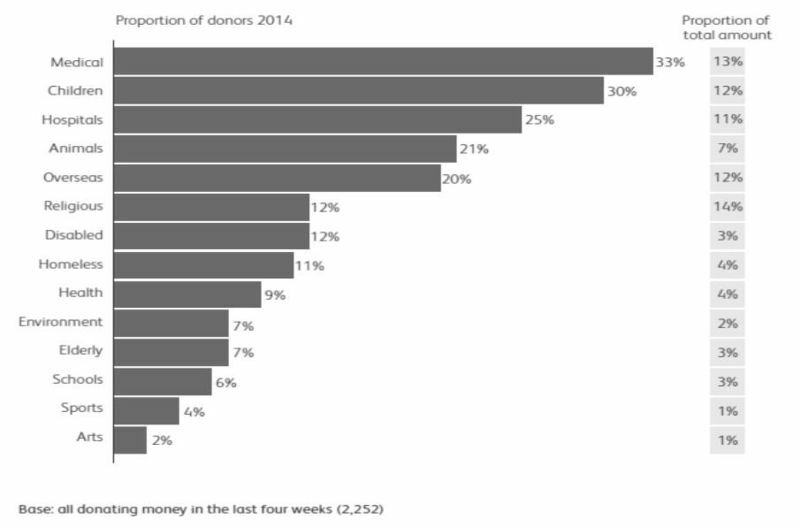 But medical charities are by far the most popular cause and receive almost one-quarter of all donations, if one regards medical and hospitals (including hospices) as a single item. It is clear that "choice between funding the National Health Service or the Royal Opera House" is a tendentious way of summarising the issue, though if one did put it that way, donors greatly favour health over the arts. In <i>Gallagher v Church of Jesus Christ of Latter-day Saints a local authority argued that a Mormon temple was not entitled to rating relief because it was not a place of "public" religious worship. The right of entry was reserved to Mormons who have acquired a "recommend" from the bishop after demonstrating belief in Mormon doctrine, an appropriate way of life and payment of the required contribution to church funds. Such members are called Patrons and the rituals which take place in the temple are exclusive to them. The church argued that the exclusion of all but Patrons is a manifestation of their religion. Therefore, to deny them exemption on that ground would be to discriminate against them on grounds of religion, contrary to articles 9 and 14 of the Convention. ↑ This chapter only considers the UK position, but the issues are international: see Chia "Charitable Treatment?—a Short History of the Taxation of Charities in Australia" http://law.unimelb.edu.au/files/dmfile/CharitableTreatmentPaper2.pdf. ↑ Footnote original: For summaries, see Charles T Clotfelter, Federal Tax Policy and Charitable Giving (University of Chicago Press, 1985); J Johnson, 'The Determinants of Charitable Giving with Special Emphasis on the Income Deduction Under the Income Tax—A Survey of the Empirical Literature' (1981) 3 Canadian Taxation 258; Scharf, Hogg, and Cherniavsky, Tax Incentives for Charities in Canada, (Working Paper No CPRN, No 03, Canadian Policy Research Networks, 1997) http://www.cprn.org/documents/31210_en.pdf, 4–5.